Rixxan Z created a brand new Samsung concept phone here, that features a bit of a mistake, if I may say so. As far as I know, a device can’t feature a screen that’s both a TFT and Super AMOLED. Of course, if you have extra info to deny or confirm that you should post that in the comments section. 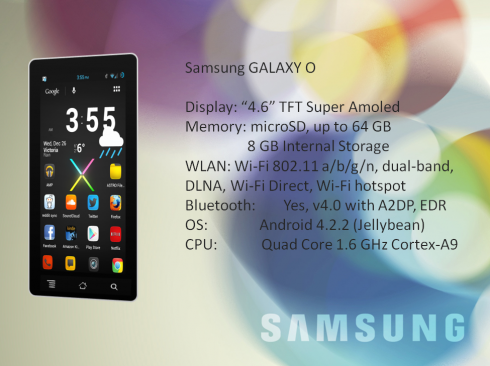 Samsung Galaxy O is a 4.6 inch handset, probably with a Super AMOLED display in the end and other specs include a microSD card slot, 8 GB of storage, WiFi dual band, DLNA and Bluetooth 4.0. There’s also Android 4.2.2 Jelly Bean, running on a quad core 1.6 GHz Cortex A9 processor. The specs may seem a bit outdated and I can’t really tell where this model fits in the Samsung lineup. Maybe if they place a lower power Exynos CPU inside it, like the equivalent of a Snadpragon 200 or 400, it would work… Or maybe it’s a Snapdragon or MediaTek.